Our team has just released SparkPost Signals, a new feature that helps you find and fix the complex issues that affect email performance. Signals analyzes your email sending to show you the health of your email and provides recommendations to fix any problems it finds. Did you know that more than 37% of the world’s B2C email is delivered using SparkPost technology? That data footprint has given us unique insight into the characteristics of high-performance email senders. Our data science team has leveraged that insight to benchmark your sending against more than 1 trillion events and to give you early warning about any potential issues before they impact your business. 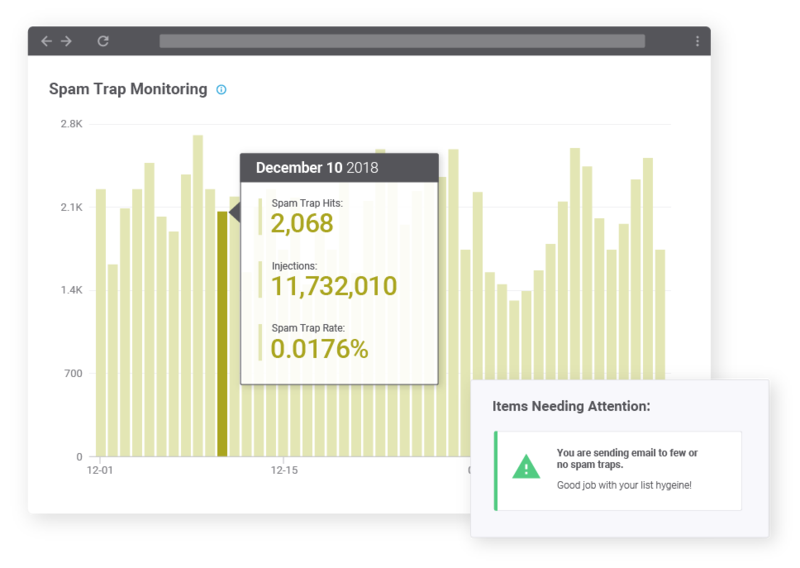 Today, your Signals dashboard includes three major indicators of your email performance: Health Score, Spam Trap Monitoring, and Engagement Recency. I like to think of the Email Health Score signal like a credit score for email. Your credit score predicts risk, such as how much trouble you’ll have paying back any loans. Similarly, your health score predicts whether you’ll have trouble with engagement or deliverability. Your health score is composed of 8 different factors that include list quality, hard bounces, recipient engagement, and more. You can dig into each of these, see the change over time, and get recommendations on how to improve the negatively contributing factors. Your Health Score is updated daily, with values between 0 and 100, informing you of your sending health as compared to all senders on SparkPost. You’re in pretty good shape if you’re clocking a Health Score above 80. Spam Trap Monitoring reports the share over time of your total email volume that was sent to known spam traps for each given day. This indicator is important to watch closely, because an excessive rate of spam trap hits probably points to some poor list procurement and hygiene practices. You can view the spam trap hits as a raw number or a ratio over the number of injections for that day. 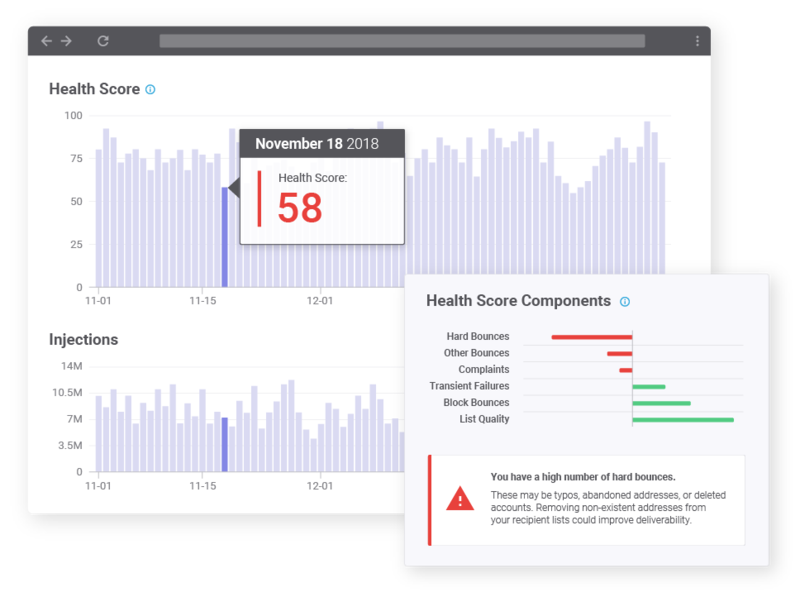 As with the Health Score signal, Signals provides recommendations for you to go about improving the underlying issue, and through that, your spam trap hits. Last up is Engagement Recency. Mailbox providers such as Gmail monitor how their users engage with the mail they receive to decide the senders’ inbox placement. This makes engagement a vital metric to look at when understanding your deliverability and overall sending health. Engagement Recency summarizes how your recipients are engaging by grouping them into different cohorts ranging from people who have engaged in the past two weeks to people who haven’t engaged with your messages in over a year. 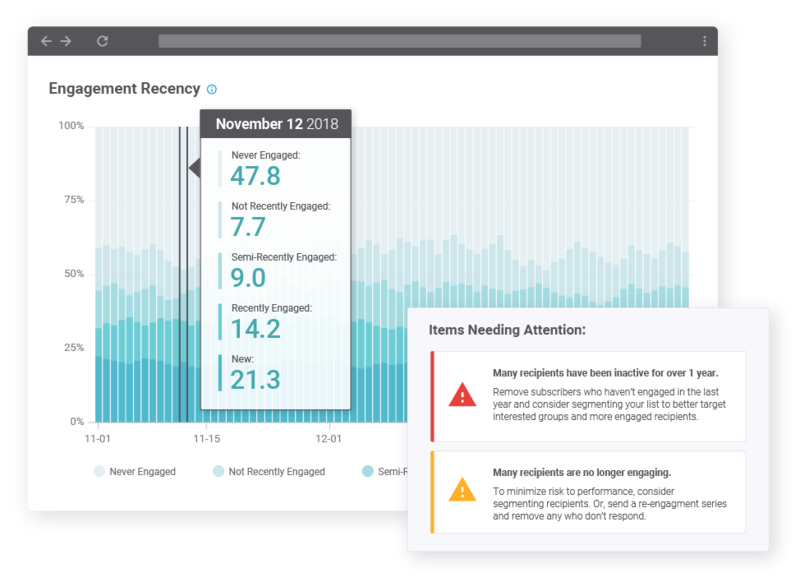 With this data in hand, Signals provides recommendations to increase your engaged recipients and reduce unsubscribes, bounces, and spam complaints. I hope you’re as excited as we are about SparkPost Signals. It’s a great new way to improve your email performance—but it’s only the start. In fact, we’re already working to build upon this foundation. As always, we’d love to hear your thoughts! Send us your feedback or suggestions on how we could make Signals better for you. SparkPost's VP of Engineering & Cloud Operations, Chris McFadden, talked email and SparkPost Signals on theCUBE at AWS re:Invent 2018.